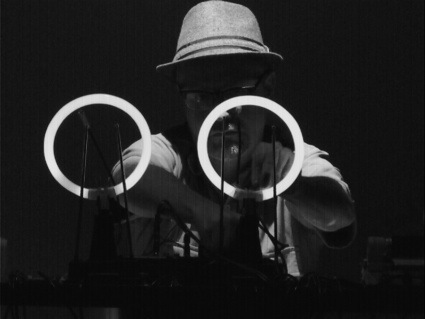 Aernoudt Jacobs is an artist fascinated with sound in all its forms and possible expressions. He collects fields recordings around the world but he also creates installations based on Bell’s photoacoustic effect that reveals the sonority of any material hit with a strong beam of light, builds sound microscope that magnifies the freezing and melting process of water or suspends coils, magnets and 1000 tin cans into the air to play with the laws of electromagnetic induction and generate tiny vibrations that produce sounds. It is as if everything in the visible and the invisible world provides him with endless opportunities for sound exploration. Hi Aernoudt! I was expecting you to have trained as an artist or musician but i discovered in your bio that you studied Architecture in St. Lukas Ghent. How did you get to go from architecture to sound? How is your architectural training helping you approach your work with sound? First there was sound/music then I discovered architecture and after that I came back to music/sound again in a professional way. Sound never really left me. I needed more freedom, the kind of freedom you rarely find in architecture. I left the studies after 4 years because real creativity is only a very small part of the job. Anyway that is how I perceived it. But the study itself is extremely broad and it gives a lot of insight. So I never build anything, I did a few years of assistance. In a way, making sounds/installation is a very architectural process. And a lot of elements of the studies just came back in my actual work (like technological research, using 3D software, material science, philosophy, anthropology, …) I’m very glad with that background. I just regret that the aspects of acoustics in architecture or even aural architecture was not developed at all in the courses at that time. I think my path would have been completely different if I would have started the studies today. I hear and read that a lot has changed in this regard. Also much more research and publications have been done in the field of building acoustics. There has been an exponential increase in knowledge during last 25 years. And still yet too many buildings have awful acoustics, even spaces where acoustics should be a primordial preoccupation. There is no sound without space, that is the link between sound and architecture. And I think it is also the main reason why you find a lot of composers who studied architecture. You are sound artist. But your installations are visually very elegant. Could you talk to us about the visual aspect of your work? How important is it to you? And how does it complement the sound work? I am an artist that works primarily with the medium of sound. The seed of any work starts with a sonic aspect, and so to speak it progresses from that in a visual way. In general I never disconnect the sonic from the visual in my installations. They are always in tandem. 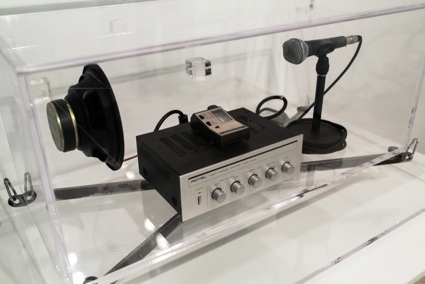 Only a few times I was commissioned to make a ‘speaker or headphone’ installation because of certain limiting situations (like a public space or imposed infrastructure, …) and even then the sound was indirectly evoking images. The visual is also quite important because I tend to work on the transition between what you hear and what you see. The visual is a kind of an interface that brings the medium into motion, into the space, or into something that you can listen to. This interface can be highly technological because I am interested in phenomena, science, experimentation. Or it can be low-fi because I’m an autodidact mostly interested in carrying out research by myself, interested in the first hand experiences of phenomena. In fact, I see it a bit of prolongation of my field recording work where I hunt for sounds or when I try to grasp the origins of sounds. Neither of my installations are loud, that is another reason why the audible elements shifts easily into the visual because the balance has been carefully weighted. A couple of your works investigate the photoacoustic effect, a discovery made by Alexander Graham Bell. The technique consisted in creating sound by exposing certain materials to focused beams of light. Light creating sound! That’s pretty fascinating. Do you know if there are applications of this effect in non-artistic contexts? Have you ever dreamt of everyday life applications of the photoacoustic effect? Actually there are a couple of applications that came from Bell’s photoacoustic research: fiber-optic communication and the CD player. But those inventions came only definitively through many years later when lasers were invented. I was reading the description of The Photophon Principle. It says that with the work you were trying to provide a certain kind of musicality: “but in the form of an installation, not of a playable instrument”. Why was it important to underline that this is not about making music? The research around the photoacoustic effect has multiple facets. And at that stage of writing I was primarily interested in presenting a work about a transformation process. 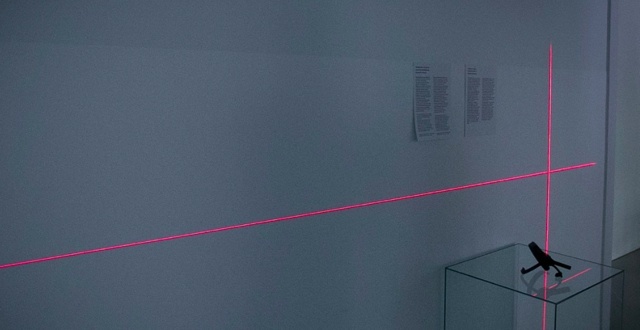 Making a composition would ruin the perception of that installation. But just recently I had to make acoustic measurements on Photophon in an anechoic chamber. It would be very interesting to develop a composition in these conditions, then I would definitely treat it as an instrument. Sonically I was very much triggered by the digital sound that Photophon produces. Making installation work or making a compositions are very different things. A composition is final once it has been published. It has a definite time factor. An installation is not. It is more flexible and it can evolve according to a different factors (space, situation, time, perceptive scope of the visitor, process of development). An installation will never be presented the same way twice. Do you think it is best to understand the techy/scientific background of some of your pieces to appreciate them? Or can they be enjoyed purely for their sound and the experience they transmit? 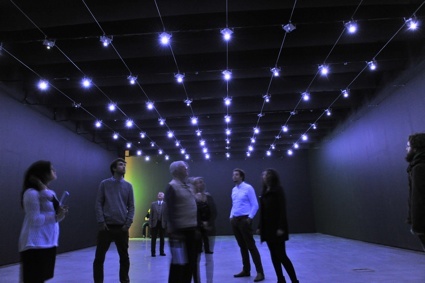 The sound and the research of perception in my installations are certainly more important than the technology they use. That said the installations are part of a long process, I’m not interested in hiding completely the technology either. Technology and knowledge is a medium, it is a tool for research. It also depends on what or how I want to present something. It is more a matter of focus. Could you tell us about Overtoon which you co-direct with Christoph De Boeck? The objective of this platform and production facility is to ‘support artists and give new impulses to the field of sound and media art.’ How do you do that? I thought it was already difficult for young artists to support themselves so how do you manage to help other artists as well? And which kind of support do you provide them with? Overtoon operates since 2013 as a platform for sound art and media art with a strong connection to sound. The platform has major a focus on production, research, residencies, distribution, sharing. Overtoon gives the possibility to develop further our own works, and it also offers yearly long-term residencies to artists with the aim to produce their works; they can also participate in our structure and benefit fully from our facilities. We are currently situated in a high-rise in the centre of Brussels. They get a studio for one year and can work at their own pace on a specific production that we agreed on. During that year we follow-up the process, we hold regular meetings and we look out for possible partners or presentations. On a parallel level, Overtoon is also supporting the ongoing experiments of other artists; this is more short-time (weeks to couple of months) and depends mostly on request we get and the spaces we have available. We are actively distributing the works that we produce too, we are organising exhibitions, or we are in contact with venues to discuss the distributions of these works, we facilitate between the artists and the organiser, we develop exhibition contexts. For example we are presenting productions during 4 periods in France in 2015 and 2016. It is a form of two double presentations in Rennes at Le Bon Acceuil (and festival Maintenant) and festival Interstices in Caen. Four different productions are being presented during the interval of 2 years. Last year we also organised a bigger exhibition Sense of Sound with eight works in Z33. Besides this we organise lectures or presentation relating to the works we produce but it can also be anything touching the field of sound art (producing, presenting, curating, research, science, networks, history, expertise, future developments, …) In the frame of the exhibition at Z33 we organised a symposium. I also had a look at the list of artists who undertook a residency with Overtoon and their work is pretty impressive. Each of them has a really strong portfolio. How do you come upon and select the artists to support? Indeed we are very glad with the responses and productions we have so far. Past yearly residents artists were Jeroen Uyttendaele, Jeroen Vandesande, Gert Aertsen and Stijn Demeulenaere. And this year we have Erik Nerinckx and Katerina Undo. We don’t write out calls. But we organise regular meetings with artist whose works we follow-up. We are open to propositions, and we are also in contact with curators. Sometimes these meetings evolve in time into specific projects, production or residencies. Now i have a bit of a tricky question (and you can ignore it if you like). In general, our society is very ‘visual’. 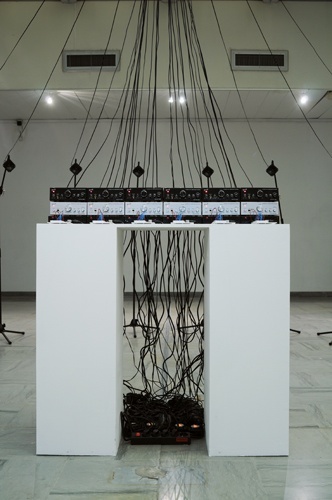 I sometimes feel that it is not so simple to write about sound art. It’s quite easy to just fall back onto a technical description of the piece, for example. If i look at the art section of mainstream newspapers, they are full of ‘visual art’ and ‘music’. And sound art falls back somewhere in the middle. Do you feel that sound artists have a disadvantage compare to visual artists? On the other hand, as I see it, it is a great way to say that anything can be done with sound. You are right to say that our society is visually driven, furthermore I would say that sound has no image, does not need it. Sound can trigger the visual cortex, the visual imagination and give you information about a space..
That work has been featured in Science magazine. While still in a research phase, the prototype has been presented during the exhibition KONTINUUM in Vienna which was organised by Roman Kirschner‘s Liquid Things. The development was in collaboration with EMPA, Angewandte and Liquid Things. I don’t have any specific dates yet for final presentations. There is a solo exhibition in Kristiansand Kunsthall, Norway that I’m preparing for early September. It is a big exhibition with one in situ work and different other works. It has already a nice title ‘Once also this was a mutation’ and many of the works deal with the idea of transformation. The exhibition is also part of the PUNKT festival and will feature live performances in the installations by Nils Christian Moe-Repstad, Espen Reinertsen and Marcus Schmickler. The exhibition is curated by Kjell Bjorgeengen. Heliophone, based on the photoacoustic effect, will be presented in STUK, Leuven at the end of September. This will be accompanied with a small exhibition that lays out the complete photoacoustic research. Image on the homepage by Kristof Vrancken. Posted in installation, interview, sound. Bookmark the permalink.